Protocol simplification is an important aspect in the development of organic reactions such as heteroarene functionalizations. 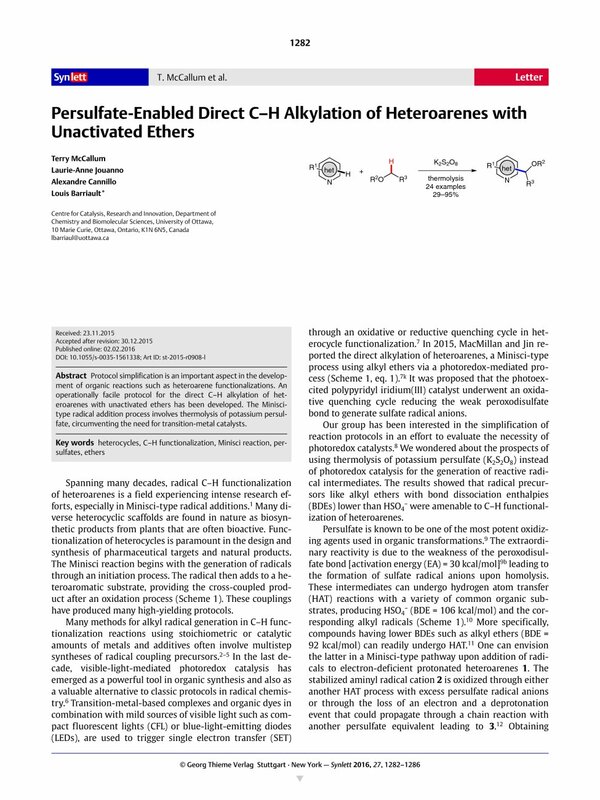 An operationally facile protocol for the direct C–H alkylation of heteroarenes with unactivated ethers has been developed. The Minisci-type radical addition process involves thermolysis of potassium persulfate, circumventing the need for transition-metal catalysts. Supporting information for this article is available online at http://dx.doi.org/10.1055/s-0035-1561338. 15 Direct C–H Alkylation of Heteroarenes with Unactivated Ethers; General Procedure To a solution of heterocycle (0.5 mmol) in a mixture of acetone/H2O (for cyclic ethers, 7:3, 3.5 mL/1.5 mL) or MeCN/H2O (for acyclic ethers, 9:1, 4.5 mL/0.5 mL) was added the corresponding ether (10 mmol, 20 equiv), K2S2O8 (405 mg, 1.5 mmol, 3 equiv) and TFA (40 μL, 0.5 mmol, 1 equiv). The mixture was then stirred for 1.25 h (with dioxane) or 2 h (other ethers) under reflux. The reaction was quenched with sat. aq NaHCO3 (8 mL) and extracted with EtOAc (2 × 25 mL). The combined organic phases were dried over MgSO4 and concentrated under reduced pressure. The crude product was further purified by chromatography on silica gel to give the desired product. Products were characterized by 1H and 13C NMR, IR, and HRMS. Compounds 3a−e 7k 3k,o,13d 3m,14a 3p,v,13a and 3q 13e were synthesized according to the general procedure and characterized by NMR comparison. See SI for analytical data, and NMR spectra (1H and 13C) of all new compounds. 2-(1,4-Dioxan-2-yl)-4,6-dimethylpyridine (3f): Prepared according to the general procedure; purification on silica gel: EtOAc/hexanes 2:8, colorless oil, 37 mg (0.19 mmol, 38%). IR (neat, cm–1): 2956, 2853, 1609, 1597, 1456, 1346, 1277, 1115. 1H NMR (400 MHz, CDCl3): δ = 7.08 (s, 1 H), 6.88 (s, 1 H), 4.68 (dd, J = 10.4, 2.8 Hz, 1 H), 4.11 (dd, J = 11.6, 2.8 Hz, 1 H), 3.93–3.88 (m, 2 H), 3.81–3.69 (m, 2 H), 3.49 (dd, J = 11.6, 10.0 Hz, 1 H), 2.48 (s, 3 H), 2.30 (s, 3 H) ppm. 13C NMR (101 MHz, CDCl3): δ = 157.5 (C), 157.1 (C), 148.0 (C), 123.4 (CH), 118.5 (CH), 78.6 (CH), 71.5 (CH2), 67.1 (CH2), 66.4 (CH2), 24.3 (CH3), 21.0 (CH3) ppm. HRMS (EI): m/z calcd for C11H15NO2 [M+]: 193.1102; found: 193.1116. 4-(1-Ethoxyethyl)-2-phenylquinoline (3g): Prepared according to the general procedure; purification on silica gel: Et2O/hexanes 5:95 to 15:85, colorless oil, 72 mg (0.26 mmol 52%). IR (neat, cm–1): 2974, 2868, 1734, 1697, 1553, 1445, 1346, 1236, 1108. 1H NMR (400 MHz, CDCl3): δ = 8.24–8.16 (m, 3 H), 8.11 (d, J = 8.0 Hz, 1 H), 8.00 (s, 1 H), 7.73 (ddd, J = 8.2, 7.0, 1.1 Hz, 1 H), 7.56–7.52 (m, 3 H), 7.49–7.45 (m, 1 H), 5.20 (q, J = 6.4 Hz, 1 H), 3.52 (qd, J = 7.0, 1.2 Hz, 2 H), 1.65 (d, J = 6.8 Hz, 3 H), 1.28 (t, J = 7.0 Hz, 3 H) ppm. 13C NMR (101 MHz, CDCl3): δ = 157.4 (C), 150.4 (C), 148.8 (C), 139.9(C), 130.8 (CH), 129.4 (CH), 129.3 (CH), 128.9 (2 CH), 127.6 (2 CH), 126.2 (CH), 125.1 (C), 123.0 (CH), 115.4 (CH), 74.7 (CH), 64.8 (CH2), 23.5 (CH3), 15.6 (CH3) ppm. HRMS (EI): m/z calcd for C19H19NO [M+]: 277.1467; found: 277.1506. 4-(1-Butoxybutyl)-2-phenylquinoline (3h): Prepared according to the general procedure; purification on silica gel: EtOAc/hexanes 5:95, colorless oil, 114 mg (0.34 mmol, 68%). IR (neat, cm–1): 2953, 2868, 1737, 1595, 1346, 1236, 1091. 1H NMR (400 MHz, CDCl3): δ = 8.23–8.18 (m, 3 H), 8.11 (d, J = 8.4 Hz, 1 H), 7.97 (s, 1 H), 7.72 (ddd, J = 8.0, 6.8, 1.2 Hz, 1 H), 7.56–7.51 (m, 3 H), 7.47 (tt, J = 6.8, 1.6 Hz, 1 H), 5.00 (dd, J = 8.4, 4.8 Hz, 1 H), 3.48–3.42 (m, 1 H), 3.39–3.33 (m, 1 H), 1.95–1.79 (m, 2 H), 1.65–1.54 (m, 3 H), 1.53–1.37 (m, 3 H), 0.97 (t, J = 7.2 Hz, 3 H), 0.91 (t, J = 7.6 Hz, 3 H) ppm. 13C NMR (101 MHz, CDCl3): δ = 157.1 (C), 149.7 (C), 148.7 (C), 139.9 (C), 130.7 (CH), 129.3 (CH), 129.2 (CH), 128.8 (2 CH), 127.6 (2 CH), 126.0 (CH), 125.4 (C), 123.1 (CH), 116.0 (CH), 78.9 (CH), 69.5 (CH2), 39.9 (CH2), 32.1 (CH2), 19.5 (CH2), 14.0 (CH3) ppm. HRMS (EI): m/z calcd for C23H27NO [M+]: 333.2093; found: 333.2080. 4-(Tetrahydrofuran-2-yl)-2-phenylquinoline (3i): Prepared according to the general procedure; purification on silica gel: EtOAc/hexanes 5:95 to 20:80, white amorphous solid, 98 mg (0.36 mmol, 72%). IR (neat, cm–1): 2980, 2858, 1597, 1506, 1076. 1H NMR (400 MHz, CDCl3): δ = 8.22–8.17 (m, 3 H), 8.05 (d, J = 0.8 Hz, 1 H), 7.91 (dd, J = 8.4, 0.8 Hz, 1 H), 7.72 (ddd, J = 8.4, 6.8, 1.2 Hz, 1 H), 7.55–7.51 (m, 3 H), 7.46 (tt, J = 7.2, 1.2 Hz, 1 H), 5.67 (t, J = 6.8 Hz, 1 H), 4.31–4.26 (m, 1 H), 4.12–4.06 (m, 1 H), 2.71–2.62 (m, 1 H), 2.16–1.99 (m, 2 H), 1.95–1.87 (m, 1 H) ppm. 13C NMR (101 MHz, CDCl3): δ = 157.4 (C), 150.0 (C), 148.4 (C), 140.0 (C), 130.6 (CH), 129.3 (CH), 129.1 (CH), 128.8 (2 CH), 127.7 (2 CH), 126.0 (CH), 124.6 (C), 123.0 (CH), 114.3 (CH), 77.0 (CH), 69.0 (CH2), 34.0 (CH2), 26.0 (CH2) ppm. HRMS (EI): m/z calcd for C19H17NO [M+]: 275.1310; found: 275.1310.